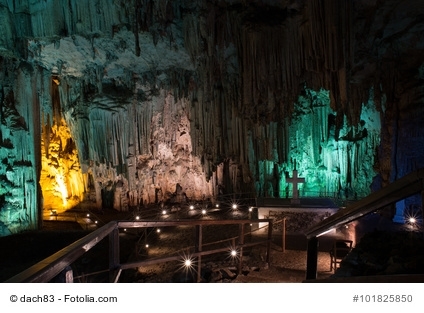 The Melidoni Cave is a worthwhile excursion destination in Crete by rental car. It is not far from the town of Rethimno and the holiday resorts of Bali and Panormo on the north coast of the island. There is a free parking place in front of the cave. You park your car and walk to the entrance of the cave. The entrance fee is 4 Euro (as of 2017). The Melidoni Cave begins 50 metres behind the entrance. The rock grotto on Crete today is mostly called Melidoni Cave. In Greek it is called Gerontospilos. Since this name is not easy for the foreign tourists, it was renamed after the village Melidoni. The small village is about 2 kilometres away..
One descends on sparsely lit steps. After an estimated 80 steps or about two minutes you reach the lowest point of a large room in the Melidoni Cave. The room is more than 60 metres long and over 20 metres high. The well done low lighting leaves an uncanny impression on the visitor. You see huge stalactites hanging from the ceiling. From time to time you can feel a drop of water. A path goes along the walls of the cave. After a few minutes the tour is finished. One goes up the stairs again and leaves the Melidoni Cave. On a hot summer's day in Crete, a visit to the year-round cool cave near the village of Melidoni is a welcome refreshment. It actually consists of several rooms, of which only one can be visited. The Melidoni Cave was already inhabited in the Minoan period. Numerous vessels, shards and a fireplace were found. These finds are now housed in museums. Some of the paintings date from other periods, for example from the Roman period. Other indications point to the time of the Turkish occupation. At that time the Melidoni Cave became sadly famous. 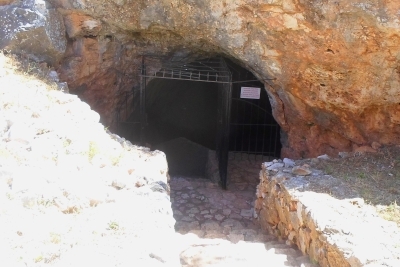 Local Cretans and resistance fighters against the Turkish occupation hid in the cave rooms of Melidoni in 1824. The Turkish occupiers set fire to the entrance to suffocate the people in the cave. 340 Cretans in the cave died in agony. For this event the Melodoni Cave is famous in Crete and all Greece. Every child in Crete knows the events of 1824. Like the Arkadi Monastery, which is not far away, the Melidoni Cave is a symbol of resistance to the Turkish occupation of Crete in the 19th century. The bones of the resistance fighters are kept in a shrine at the bottom of the large cave chamber. If you visit the cave of Melidoni, you will get a very good little brochure about the history of the cave. It is already included in the entrance fee and available in different languages including German. In front of the entrance there is a small café and a WC. Most visitors do not need more than 30 minutes to visit the Melidonia Cave. The walking time is about 10 minutes. The village of Melidoni is worth a visit. It is a traditional village, typical for the interior of Crete. At the central square there are some classic kafenions. One crosses the village and the village square by car if one drives to the cave. At the edge of the village of Melidoni there is an olive oil factory worth seeing. Admission is free. One gets a good overview of the history of olive oil production. There is the possibility to buy high quality olive oil from Crete at a reasonable price. We visited the cave at the beginning of April. At this time only about 10 other cave visitors were present. But you can guess what is going on in summer. There are even some hotels around Melidoni. From the town Panormo you cross the underpass of the expressway. This can be found by following the signs for Iraklio until the underpass. Shortly after the underpass of the expressway, the "Melidoni Cave" is signposted for the first time. At the entrance to Perama, turn left. This is also signposted. The total distance is 12 kilometres. From Bali Crete take the expressway towards Rethimnon. At the entrance to Bali there is a sign "Melidoni Cave 8 km". But we did not find the exit and drove over Panormo. At the end we were after 22 km at the cave. If you have a good map and a rental car, you can continue from Melidoni to the very interesting monastery of Arkadi. You have to find your own way through several villages. There are signs to the monastery only shortly before the destination.